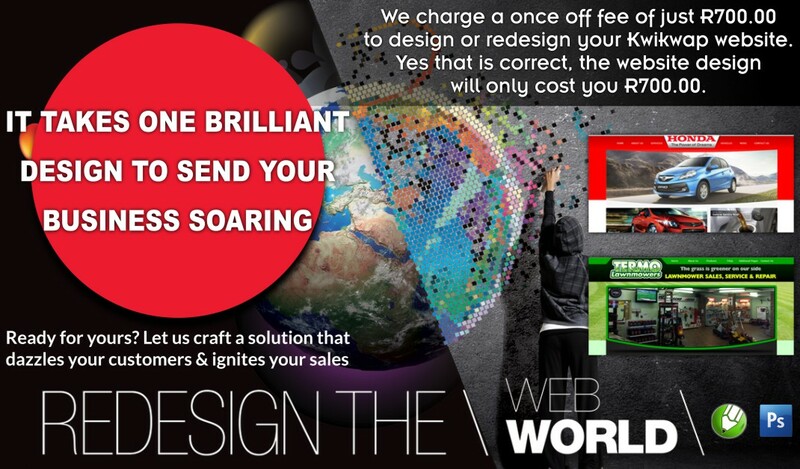 We charge a once off fee of just R700.00 to design or redesign your Kwikwap website. Yes that is correct, the website design will only cost you R700.00. Should you have no logo, we will do a basic text logo design for the website. 2.) We design the slides for the home page. 3.) We design all of the graphics for the home page, eg blocks / rings / banners - basically everything to make an attractive home page. 4.) We design a banner that goes at the bottom of the homepage to end off the design of the website page. 5.) Should you have a Facebook page,we will add a live Facebook feed to your home page. We then take the above graphics and upload all of these and design the website via the Kwikwap website management portal as well as edit the css of the website to make a professional website design. Please note that the above price is for the design of the website, it does not include working on the content or mobile design of the website. Should you wish to view examples of other Kwikwap websites that we have designed, please view our portfolio here.